Chess pie? No one seems certain where the name for this simple pie comes from. A simple combination of eggs, sugar, and butter, with the tiniest bit of flour or cornmeal for thickening, chess pies appeared in print as early as the late 19th century. Some food historians say "chess" is a takeoff on "cheese," as in English cheese pies, as in American cheesecake — whose filing is of a consistency similar to chess pie. Others say chess refers to the chest in which pies used to be kept; due to the high degree of sugar, chess pies didn't need to be refrigerated (though in these days of heightened awareness of food safety, we do recommend refrigeration). One final theory holds that chess refers to the simplicity of the pie itself. "What kind of pie is that?" "Jes' pie." Chess pie. Whatever its provenance, this pie is perfect for those of you who love lemon, but don't like the somewhat "gluey" texture (or mile-high meringue) of a classic lemon meringue pie. This humble pie has no meringue to hide beneath; it's just lemon at its simple best. 1) To make the crust: Whisk together all of the dry ingredients, reserving a few tablespoons of the flour. 2) Work in the shortening until it's well combined with the dry ingredients. 3) Place the reserved flour on your work surface, and coat the butter with the flour. Use a rolling pin or the heel of your hand to flatten the butter to about 1/4" thick. 4) Break the flour-coated butter into 1" pieces, and mix it into the dough, just until it's evenly distributed; some of it will break into smaller pieces. 5) Sprinkle the vinegar and 3 tablespoons of the water over the dough while tossing with a fork. Just as soon as the dough becomes cohesive (i.e., you can squeeze it into a ball easily), stop mixing; there should still be visible pieces of fat in the dough. Add up to 2 additional tablespoons water, if necessary, to make the dough come together. 6) Flatten the dough into a disk and wrap it in plastic wrap. Refrigerate for 30 minutes or longer; this resting period allows the flour to absorb the water and the gluten to relax, making the dough easier to roll out. 7) Flour your work surface and roll the dough into a 12" x 9" (approximately) rectangle. If it isn't holding together well, sprinkle it lightly with a couple of teaspoons of water. Fold the dough into thirds (like a letter), then fold it into thirds the opposite way, to form a rough square. Wrap it well and refrigerate again. 8) When you're "ready to roll," remove the dough from the fridge. Dough made with a combination of butter and shortening should rest for about 5 minutes at room temperature before rolling; dough made with all butter will need a 15-minute rest. 9) Roll the dough to a 12" to 13" circle, and settle it gently into a 9" pie pan; the pan shouldn't be over 1 1/2" deep. Flute or crimp the edge of the crust as desired. Place the crust in the refrigerator (no need to cover it) while you make the filling. 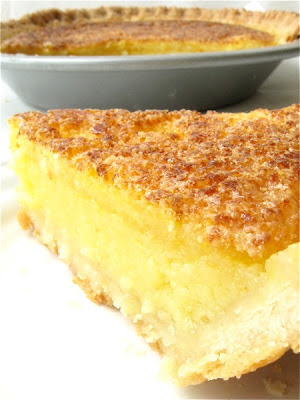 10) To make the filling: Melt the butter, and stir in the lemon juice, salt, sugar, cornmeal, cornstarch, and eggs. 11) Whisk until well combined. 12) Pour the filling into the chilled pie shell. 13) Bake the pie on the bottom shelf of a preheated 375°F oven for 45 to 50 minutes, or until the center is set. The top should be golden brown. 14) Remove the pie from the oven and allow it to cool before cutting and serving. What's with all of the different ingredients? Shouldn't pie crust be just fat, flour, salt, and water? Not necessarily. Our latest favorite pie crust recipe uses a combination of butter (for flavor) and vegetable shortening (for flakiness); an unbleached flour of about 10.5% protein (such as our Perfect Pastry Blend); buttermilk powder (for tenderness) and baking powder (for extra flakiness); salt; and vinegar (again, for tenderness) and water. Please feel free to substitute your own favorite single pie crust recipe. Note the unusual method for putting the crust together; it's designed to promote flakiness. Again, use your own favorite method if you're so inclined.